I am a person who love sweets and savories. During my childhood days, every weekend, my father used to buy some snacks and sweets for my brother and me. 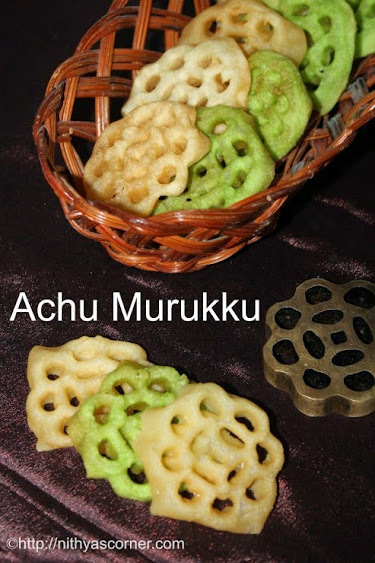 One of the snacks woul be Achu Murukku from my favorite bakery. 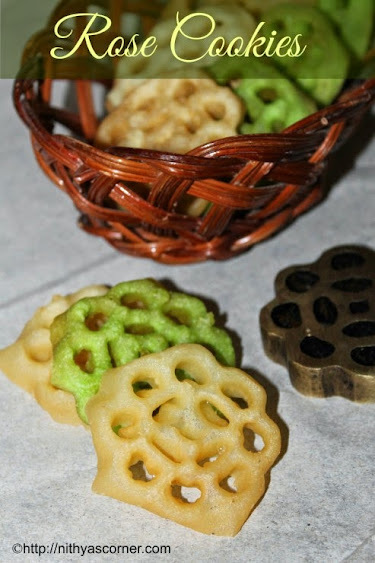 To make Achu Murukku, you need a special mould which has a long handle and at the bottom of the handle, you will find a metal sheet shaped like a flower. 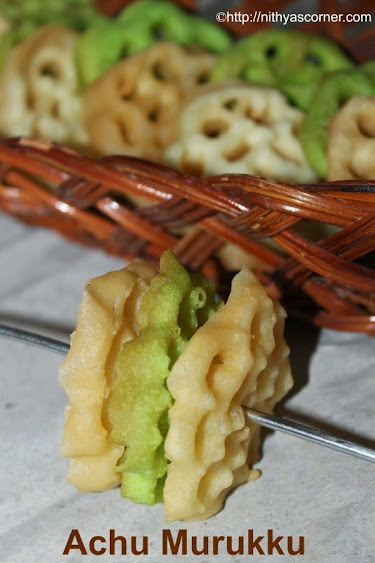 When you cook the Achu Murukku, you can hold the long handle and immerse the other end (flower end) into the batter and onto the hot oil. 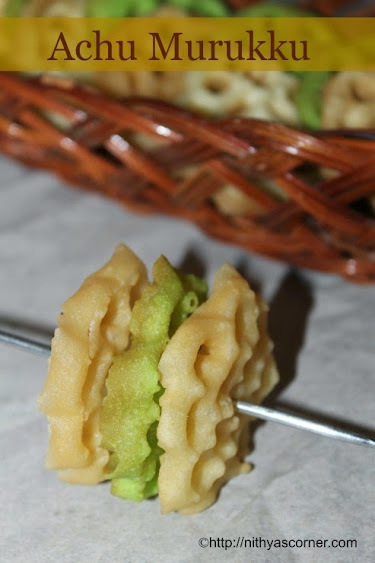 Achu Murukku mould does not come with the regular murukku mould. You have to buy it separately. 1. In a mixing bowl, add rice flour, all purpose flour, sugar, and salt. Combine well. In another mixing bowl, add the eggs and whisk well. 2. Add the beaten egg to the flour and stir well. Now add the thick coconut milk and combine well. 3. Meantime, heat oil for deep frying the Achu Murukku. Immerse the Achu Murukku mould in the hot oil and leave it there for about 5 minutes. Make sure you stir the batter well. The consistency of the batter should be like dosa batter consistency. The batter should not be either too thin or too thick. Video Link: How To Fry Achu Murukku? 4. Then take the mould out and immerse the mould quickly into the batter just halfway through (i.e) three fourth into the batter. Do not immerse the mould completely into the batter. If you immerse halfway through, it is enough. Due to the heat in the mould, the batter will stick well to the mould. Then immerse the mould into the hot oil. Just leave the mould in the hot oil for about 30 seconds, the batter will get cooked and will come out the mould by itself. If the batter does not leave the mould then shake the mould for few seconds. You may use a fork to lift the batter on all sides. 5. Once the batter leaves the mould, rest the mould into the hot oil until you are going to do the next one (third picture below). 6. 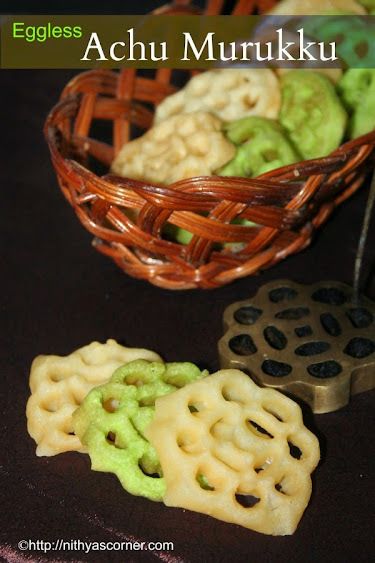 Once the Achu Murukku becomes golden in color and crispy, then take it out and drain it on a tissue paper. Now, Achu Murukku is ready! Store it in an airtight container. The batter should neither be too thin or thick. The consistency of the batter should be like Dosa Batter. Do not immerse the mould completely into the batter. If you immerse the mould 3/4th, it is more than enough. If the batter is thin, then it would not come out of the mould. It will take a lot of time. If the batter is thick, then you will not get crispy murukku. If you have bought a new mould, then wash the mould well and wipe it well. In order to temper the mould, keep it immersed in the oil for a day and then again wash and dry it. Again, keep the mould immersed again in the hot oil. Do it repeatedly for about 3 days. This entry was posted in Deep-Fried and tagged Achu Murukku on November 22, 2014 by vikashbhardwaz. I am a person who love sweets and savories. Every weekend, my father buys some snacks and sweets for my brother and me. 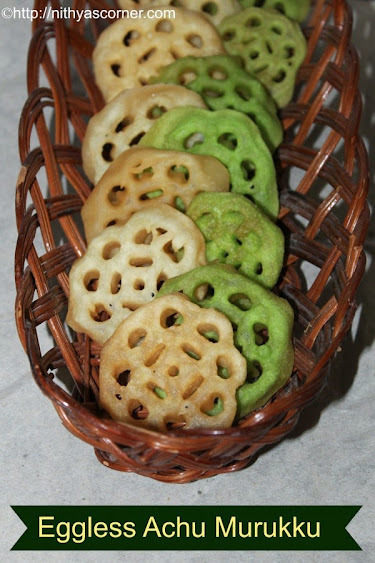 One of the snacks woul be Achu Murukku from my favorite bakery. My brother and myself would fight over it. 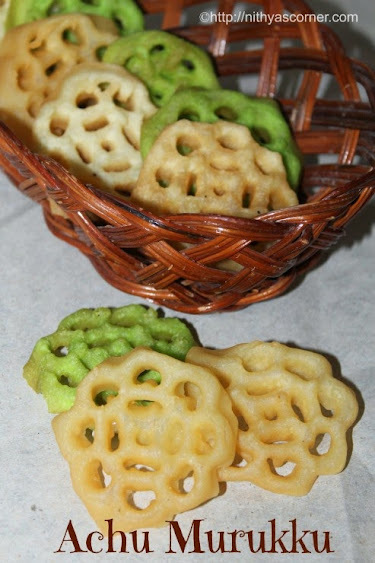 Achu Murukku are of two flavors: with sweet and the other one with lot of spices. I like both but prefer the one with sweet better. 1. In a mixing bowl, add rice flour, all purpose flour, sugar, salt, cumin seeds and combine well. Then add the thick coconut milk. Stir well. 2. The consistency of the batter should be like dosa batter consistency. The batter should not be either too thin or too thick. Now add a pinch of green food color and stir well. 3. Meantime, heat oil for deep frying the Achu Murukku. Immerse the Achu Murukku mould in the hot oil and leave it there for about 5 minutes. Then take the mould out and immerse the mould quickly into the batter just halfway through (i.e) three fourth into the batter. Do not immerse the mould completely into the batter. If you immerse halfway through, it is enough. Due to the heat in the mould, the batter will stick well to the mould. 4. Then immerse the mould into the hot oil. Just leave the mould in the hot oil for about 30 seconds, the batter will get cooked and will come out the mould by itself. If the batter does not leave the mould then shake the mould for few seconds. You may use a fork to lift the batter on all sides. 5. Once the batter leaves the mould and gets fried, again immerse the mould on to the hot oil till you fry another batch of murukku. Once the Achu Murukku becomes golden in color and crispy, then take it out and drain it on a tissue paper. 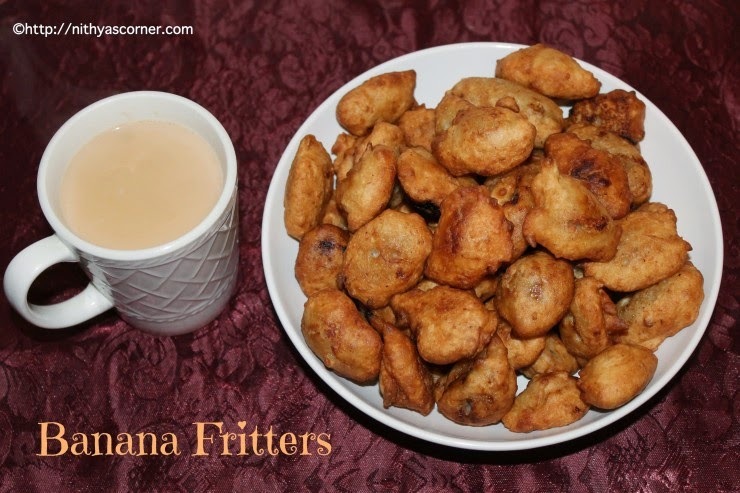 Banana Fritters is my mom’s favorite dish. She calls it by a different name. I request her to make this dish for me during the rainy season. She would make so much that each of us will have about 15 fritters. It taste great on the next day too. When I grew up, I eat this dish along with a cup of tea. We buy bananas every week and sometimes, the bananas would ripen quickly. Sometimes, I would be stuck as I would not know what to do with the ripen bananas. Whenever I have ripen bananas, I make Banana Chappthi, Banana Appam, Banana Muffin and Banana Fritters. This recipe can be made in a jiffy. When I was pregnant the second time, I would make this recipe and eat it right away. I had a strong craving for this dish. It is a very simple and easy recipe. 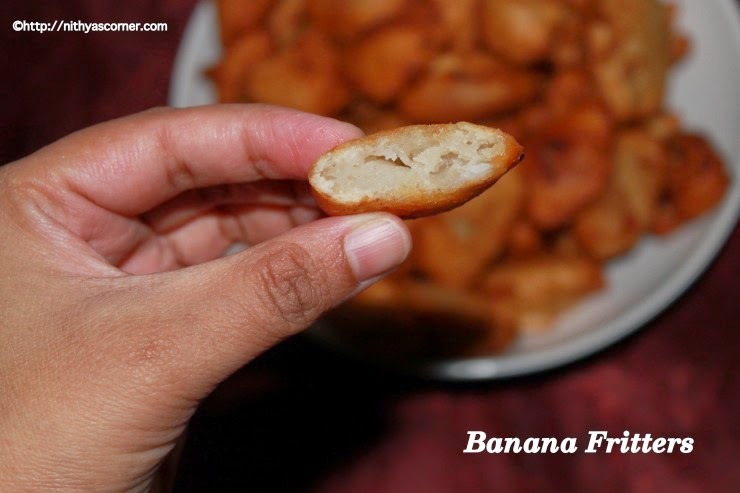 If you have guest at home, with just one banana you can make about 7 to 8 fritters. Try it out and I am sure you like it. Large bananas – 2 nos. 1. 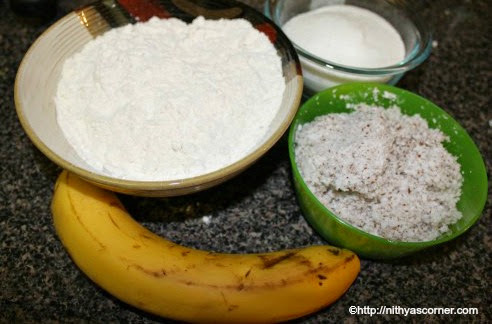 In a large mixing bowl, mix self-raising flour/maida, baking powder, and sugar. Then, add grated coconut, banana, and a pinch of salt. Add sufficient quantity of water to make a medium consistency (neither too thin nor too thick) batter. 2. Batter should have consistency to mound up in a spoon. Heat oil to deep fry the bananas. The oil should be medium hot. Drop by spoonfuls in small batches. 3. As banana fritters start becoming brown on one side, turn them over. Once banana fritters turn brown in color, remove and drain them on paper towels. You can sprinkle powdered sugar on top of the banana fritters just before serving but I love to eat it right away. I cannot wait that long. Now, Banana Fritters are ready! Serve warm. Serve. With tea or ice cream. 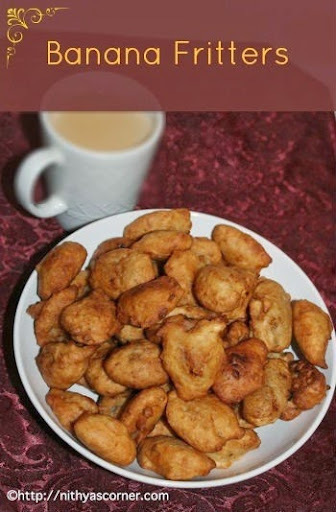 This entry was posted in Deep-Fried and tagged Banana Fritters, Recipe Category on November 22, 2014 by vikashbhardwaz. 1. Squeeze the shredded cabbage to remove excess juice. 2. Add chopped onions, grated carrot and coriander leaves to cabbage. Add chilli powder, garam masala powder, and salt. Mix well. 3. Now, add besan powder little by little until you can make balls out of it. 4. 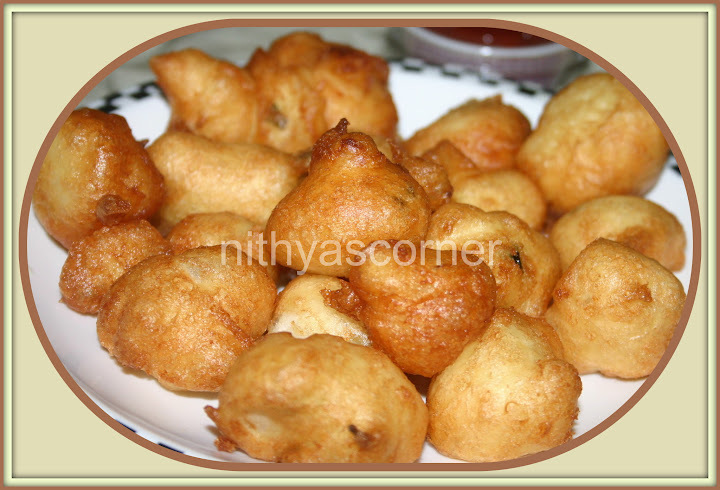 Make small balls and deep fry these balls until it becomes golden brown. Now, Cabbage Kofthas are ready! This entry was posted in Deep-Fried and tagged Chilly Powder, Finely Chopped Onion, Grated Carrot on November 22, 2014 by vikashbhardwaz. High on Flavor and Taste! 1. Soak the Channa Dal for an hour and coarsely grind it . 2. To this add the corn, onion, red chillies, ginger, cumin seeds, turmeric, curry leaves, asaefoetida and salt. 3. 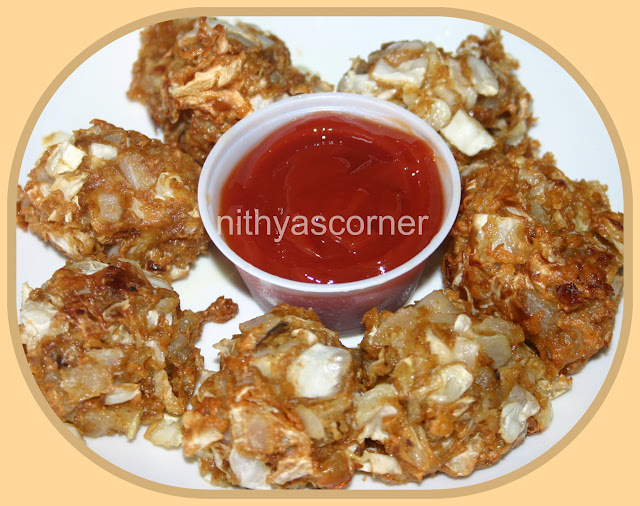 Make balls out of the above mixture, shape them as vadas or cutlets. 4. Heat oil in a pan. Deep fry the vadai in medium hot oil. 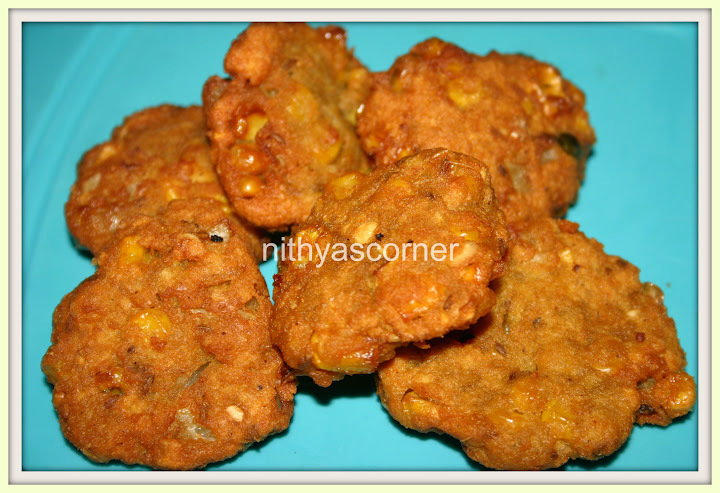 Now, Corn Vadai is ready! 1. Preheat oven to 350 degrees for 45 minutes to 1 hour. 2. Grease the baking tray or use a parchment paper (can remove the vadas easily) and arrange the vadas in a line. Sprinkle 1 or 2 drops of oil on each vada. Source. I do not know how I got this recipe. If any one owns this recipe, do let me know. I love giving credits. This entry was posted in Deep-Fried and tagged Channa Dal, Corn, cumin seeds, Curry Leaves, Turmeric Powder on November 22, 2014 by vikashbhardwaz. A simple, easy, and crispy fries! Bitter Gourd….oh no…it tastes bitter…This is what generally we say. Believe me, this Crispy Bitter Gourd Fries does not have the bitterness at all. Even kids will love it. At times, I use color. Most of the time, when I buy bitter gourd, I do it this way. Some deep fry it. I generally grill it or fry it in dosa pan using 2 tablespoons of oil. For me, since I shallow fry it, is surely a healthy recipe. Try it out and you’ll know how easy, tasty, and crispy it turns out to be! Bitter gourd – 5 to 6 nos. 1. 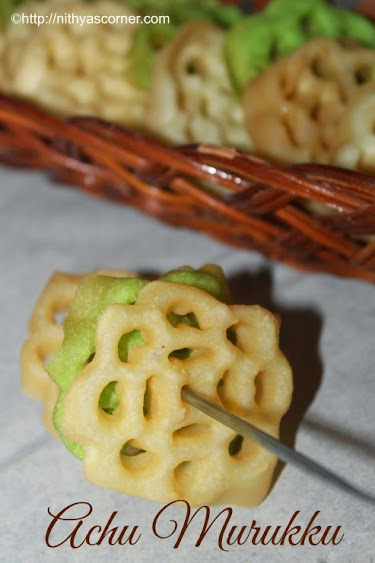 Cut bitter gourd into thin and round pieces. In a bowl, put all the ingredients except bitter gourd and add 2 tablespoons water and mix well. If you are using color, mix the color in a teaspoon of water and add it to the remaining ingredients. The consistency of the paste should neither be watery or thick paste. 2. In a frying pan, heat oil. When the oil is hot, add the bitter gourd pieces and fry until they become golden brown. 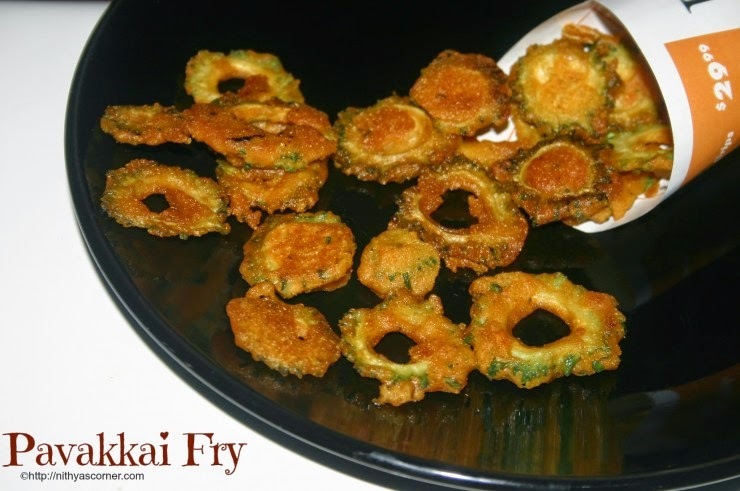 You can also shallow fry bitter gourd pieces in 2 tablespoon of oil in a pan. I have shallow fried them. Now, Crispy Bitter Gourd Fries are ready!!! You can either have it as snack or as a side dish for rice. 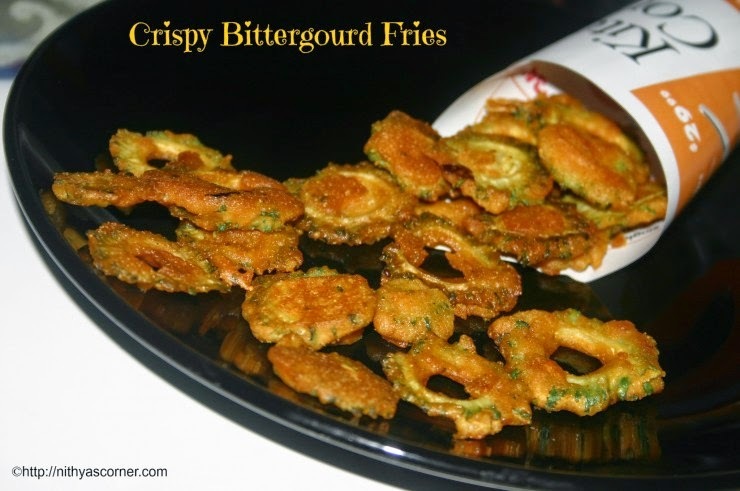 This entry was posted in Deep-Fried and tagged Bitter Gourd, Crispy Bitter Gourd Fries on November 22, 2014 by vikashbhardwaz. A Quick and Tasty Snack! Chopped Onion – 1/2 No. Curry Leaves – 6 To 8 Nos. 1. Add rava, onion, green chilly, curry leaves, soda, asafoetida and salt to the idly batter. Mix well. 2. Heat oil for deep frying. 3. Take the batter in a spoon and put it in the oil. Deep fry until it turns golden brown. Now, Easy Kunukku is ready! This entry was posted in Deep-Fried and tagged Curry Leaves, Pinch Asafoetida on November 22, 2014 by vikashbhardwaz.